Google’s API website also contains detailed information on other features that you can leverage within Checkbox. First, the coordinates item. You will want to create a single line text item, and supply the question text as Coordinates. You can change this to whatever you would like as it will not be displayed to the user. NOTE: There is no way to hide this item from an email response or alert. If you are utilizing these features, please keep this in mind. To make accessing the item easier, we suggest that you navigate to the behavior tab of the item editor, and supply a class name of coordinates. This will make it possible to select the item using jQuery later quickly. Here is the HTML from the item we created. 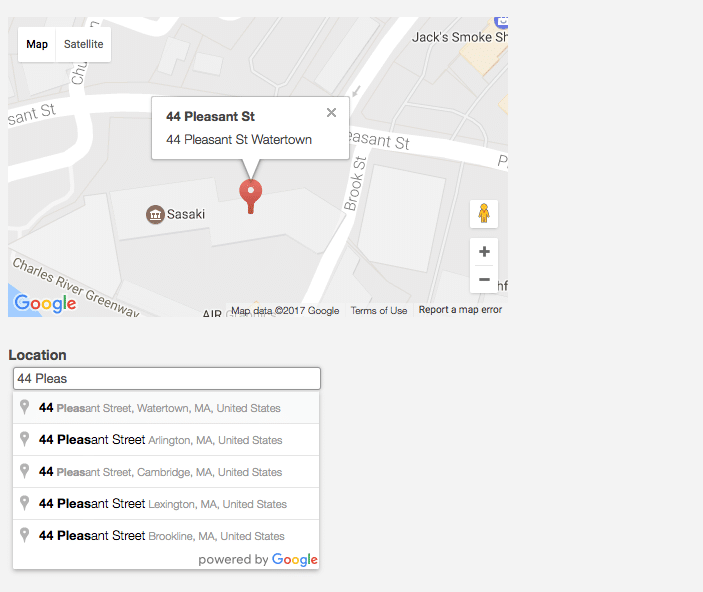 Next, we need to create the address field and the placeholder for our map. You will want to create an additional single line text item. This item will require a bit of custom HTML to support displaying the map. We need an area of space to display the map, to do this we are going to create a div, with a specified id of “map,” and set the div to be 500×300 pixels. We will also want to enter the question text for our address field here as well.